Theresa Cedillo of Yuma in Arizona puts a human face to the half-million or so American families living with autistic children. Her appearance in a Washington DC courtroom last week, alongside her severely autistic 12-year-old daughter Michelle, left no doubts about the heart-wrenching circumstances of their lives. Now Cedillo's lawyers are hoping to sow just enough doubt in the minds of judges to persuade them that, contrary to prevailing scientific opinion, Michelle's condition may have been triggered by her childhood vaccinations. Nearly 5000 families have a stake in the trial, which opened on 11 June before the US Court of Federal Claims. Their goal is to gain access to a $2.5-billion government fund set aside to compensate people harmed by vaccination. But the families, aided by a small band of doctors and scientists, will only succeed if they can show it is more likely than not that the tiny amounts of mercury once present in childhood vaccines can cause autism. They face an uphill struggle. A succession of studies (see "Perceptions do matter") has found no link between autism and a mercury-containing compound known as thimerosal, which is sometimes used as a preservative in vaccines. Nevertheless, growing public awareness that autism rates have risen sharply in the US has helped to motivate the current legal proceedings. What is less widely known is that among those who support the families' claims are researchers and companies whose expertise and ethics may fall short of accepted standards. And while the ongoing trial may not enhance our understanding of autism, it could shine a light on the behaviour of some of those who say they are helping to cure it. In many ways the case echoes a similar health scare in the UK, where a small number of doctors argued that the measles, mumps and rubella (MMR) vaccine might somehow harm a child's immune system and cause autism. The majority of these doctors have since withdrawn their claim but some activists and parents of autistic children continue to blame vaccines. In the US their accusations have tended to focus on thimerosal as a potential culprit. 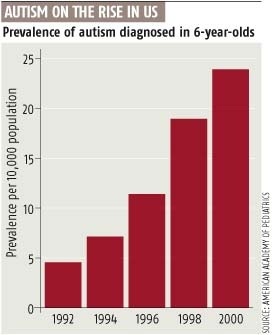 According to the US National Academies' Institute of Medicine, which surveyed the autism literature in 2004, there is little to justify that position. Although mercury is a known neurotoxin, there is no evidence that the levels present in childhood vaccines before 1999 were high enough to cause autism or any other neurological disease. Since then, as a precautionary measure, thimerosal has been phased out of most paediatric vaccines in the US and there has been no corresponding decline in autism among young children. Those findings have not, however, stopped some lawyers from discussing the link as if it were already fact. The firm of Williams, Love, O'Leary, Craine and Powers, based in Portland, Oregon, is representing the Cedillo family. The company website states that "thousands of children" have developed autism "as a result of their exposure" to thimerosal. And when they and other lawyers call for evidence, they will find plenty of witnesses to back up that statement. Perhaps the most controversial will be Mark Geier, a doctor who blames mercury for autism and advocates using compounds known as chelators to remove it from the body. In a paper published last year, Geier described how chelation combined with Lupron, a medication that lowers hormone levels, benefited 11 autistic children (Neuroendocrinology Letters vol 27, p 833). Together with his son David, who also helps to promote the therapy, Geier is feted by some parents for his radical therapy. But many aspects of their work have raised concern among parents and researchers. Safety is a major concern. Chelation is an established treatment for metals poisoning, but little is known about its impact on autistic children, beyond anecdotal reports from parents who say it has helped. But others report no success. Researchers at the US National Institute of Mental Health in Bethesda, Maryland, say they would like to test the safety of chelation, but ethics advisors there have placed a temporary halt on the proposal because there is so little evidence in favour of the treatment. Michael Shannon of the Children's Hospital in Boston uses the therapy to treat lead poisoning, but says that he has rejected every request to use it to treat autism because he has never found significant levels of mercury in the bodies of children with the condition. Without firm evidence of high mercury levels, Shannon says it is not worth exposing children to the treatment's side effects, which include temporary damage to the liver and bone marrow. Some suppliers of chelating agents, however, do not appear to be taking such safeguards. Vitamins Research Products, based in Carson City, Nevada, offers one chelator - dimercaptosuccinic acid (DMSA) - in a dose they say is appropriate for autistic children. DMSA is a prescription-only drug in the US, but the firm supplies the drug by mail order without a prescription. It says it can do this legally if the medication is prescribed in capsules of 100 milligrams or less. Firms that do demand a prescription for DMSA are sometimes vague about potential risks. The website of Lee Silsby, a pharmacy based in Cleveland Heights, Ohio, includes numerous case studies of autistic children who have been helped by chelation, but makes no mention of the side-effects that Shannon describes. The pharmacy charges $100 for a month's supply of DMSA and the therapy can last several years. Alan Israel, the pharmacy's owner, says he is working with doctors who use chelation so the safety issues can be studied, but that little money has been made available for large-scale trials. Lupron, the other component of the Geiers' treatment, is also controversial. It is only licensed in children to treat premature puberty, an extremely rare condition. In adults, it is sometimes used to "chemically castrate" sexual offenders. Although the Geiers' research involving Lupron was approved by an ethics committee, research by Kathleen Seidel, the mother of an autistic child, who blogs about the condition, has revealed that the committee is located at the Geiers' business address. Both father and son, plus Anne Geier, Mark's wife, originally sat on the committee. Other initial members included a business associate of the Geiers and a lawyer involved in vaccine litigation. Mark Geier says that the make-up of the committee has since been changed, although he declines to name the new members. Seidel also found that the Geiers copied large parts of one of their papers from a draft study, later deemed incorrect and never officially published, that had found evidence for a link between thimerosal and brain disorders in children. Geier acknowledges that he could have been more "careful" in his use of words, but denies plagiarism, saying that the data was the same because both he and the previous authors used the same database. He adds that he charges parents $500 for an initial consultation, but does not invoice them after that and so makes "virtually nothing" from his work with the families. Other researchers cited by advocates of the mercury hypothesis also have links to products sold to parents. One potential check for mercury involves a urine test for porphyrins, molecules that occur naturally in the body and bind to metals. Interest in the test accelerated last year following the publication of a paper claiming that autistic children had higher porphyrin levels than normal (Toxicology and Applied Pharmacology, vol 214, p 99). While the researchers state in the paper that they have no conflicts of interest, lead author Robert Nataf is the founder of Laboratoire Auguste Philippe, a Paris-based clinic that sells porphyrin tests. When discussing his research with parents Nataf has also stated that he has a paper "in press" at The Lancet Neurology. Editors at the journal say they have no record of a paper by him. When asked to comment, Nataf did not clarify the situation. While Nataf's failure to disclose his commercial interests may have breached normal publication ethics, it is likely to mean little to the parents of autistic children. Email groups dedicated to discussing the condition are full of pleas for help from parents frightened by a disease that shuts off their children from the rest of the world. Under such circumstances, says Israel, parents are desperate for a cure: "If you had autistic children, would you wait for published trials, or would you treat them?" Good article. Also interested in Silver Nitrate they use in the delivery room, and inducement drugs. This page contains a single entry by Toni published on June 22, 2007 10:35 AM. Fluorine is a Deadly Poison! was the previous entry in this blog. ASPARTAME CONTINUED USE A SCANDAL SAYS CRITIC is the next entry in this blog.